1. Cook the noodles in boiling water for 7-8 minutes or until tender, then drain and leave to cool. Meanwhile, mix together the soy sauce, fish sauce, lime juice and honey. 2. 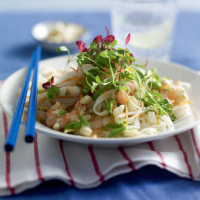 Mix the noodles with the Asian salad, coriander and prawns, then toss in the dressing. Top with the baby coriander and baby amaranth and scatter over the peanuts. Shredded cooked chicken and cashew nuts are a delicious alternative to the prawns in this dish. Try a bright refreshing rosé with this dish that has bags of personality: Mirabeau Rose 2010 Cotes de Provence, France.